This Saturday’s tea-time kick-off in Serie A sees two sides with European ambitions face each other as AS Roma travel north to Fiorentina’s Stadio Artemio Franchi. The fixture has played host to some entertaining clashes in recent times, and there is even more interest this time around as the pair have endured similarly erratic form in the opening 10 matches of the campaign. The home side and Eusebio Di Francesco’s visitors have an almost identical domestic record so far in 2018/19, with four wins, three draws and three defeats. The Viola are just one goal behind the capital club with 16 strikes this season, however the Tuscans have been much better defensively with eight goals conceded as opposed to 13. Of course, Roma are the ones with much higher expectations on them, especially after they reached the Champions League semi-finals last term. Di Francesco has been strongly linked with the sack after a disappointing start to the campaign, while opposite number Stefano Pioli is seen as the long-term solution to a youth-based project, Fiorentina boasting the youngest side on average in any of Europe’s top-five leagues. That said, poor showings at home to Cagliari and away to Torino in the last two matches have given Pioli much food for thought, as striker Giovanni Simeone continues to struggle to find the back of the net and the midfield fails to adequately supply him. If those factors are overcome, Fiorentina could secure an important result here, one that will further increase the pressure on Roma and indeed their Coach. Fiorentina remain unbeaten at home this season, and Roma will certainly find it tough to come away with all three points. History is on the side of the Giallorossi with four wins from the last six versus Saturday’s opponents, however the current incarnation of this team is having difficulty in replicating their previous good form. A look at the last six matches at the Franchi between this pair reveals two from the last six results having ended in a draw, and this seems the most likely outcome between teams with an almost identical record this term. Betfair offer odds of 13/5 for a stalemate, a bet well worth making on this occasion. Last weekend saw a very defensive display from Roma hold second-place Napoli to a 1-1 draw, and the Giallorossi could take a similar approach here in another difficult game versus a fellow top-half opponent. “I thought it was an excellent performance that saw us united, combative and with everyone helping each other out,” Di Francesco told reporters in a press conference after the match with Napoli. “That’s a great step forward for our 12th game of the season with many new players. Furthermore, statistics reveal there have been under 2.5 goals scored in Fiorentina's last four league encounters while there have also been under that same figure in six of Roma's last seven domestic away games. All things considered, it makes perfect sense to back under 2.5 strikes at 21/20, or you could combine this rate with a draw at half time and full time to get better odds of 23/4 with Karamba. Fiorentina are one of only two teams along with Cagliari who are yet to trail at home this season, and with this statistic in mind you can back the Tuscans to score first via Karamba at 20/21. Simeone to halt scoring slump? 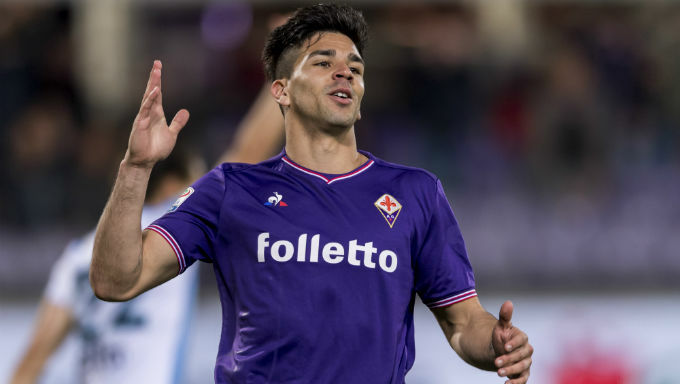 Fiorentina striker Giovanni Simeone will enter this match having endured a goal drought that has lasted through the six games proceeding it, however all the signs are positive that this determined and hard-working player will finally end the barren run this weekend. This should have given the 23-year-old the necessary wake-up call, and his record versus Roma has seen him score in his last two matches versus the capital club. BetVictor have the best price on him to score first at 7/1, and Betway offer an industry best 23/10 on him to score anytime – either bet is a worthwhile punt for a player with a point to prove.